Heavy 370 on the bench getting a lot of little 1uF caps replaced. It is a single supply amp meaning the output sits at half the supply voltage. Instead of the output signal swinging between a +/- voltage rail it swings from about 0-90VDC. 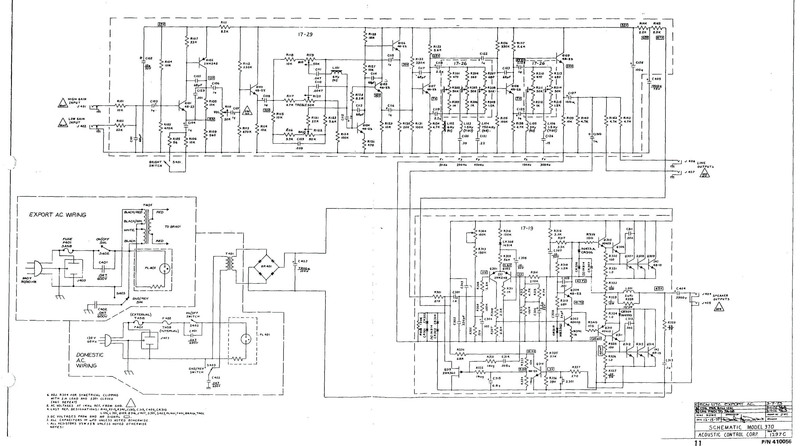 The signal is coupled from the output section to the speaker via a large cap that blocks the DC. The voltage at this capacitor must be about half the supply voltage for symmetrical clipping, with positive signal swings between ~45-90V and the negative section in the ~0-45V region. 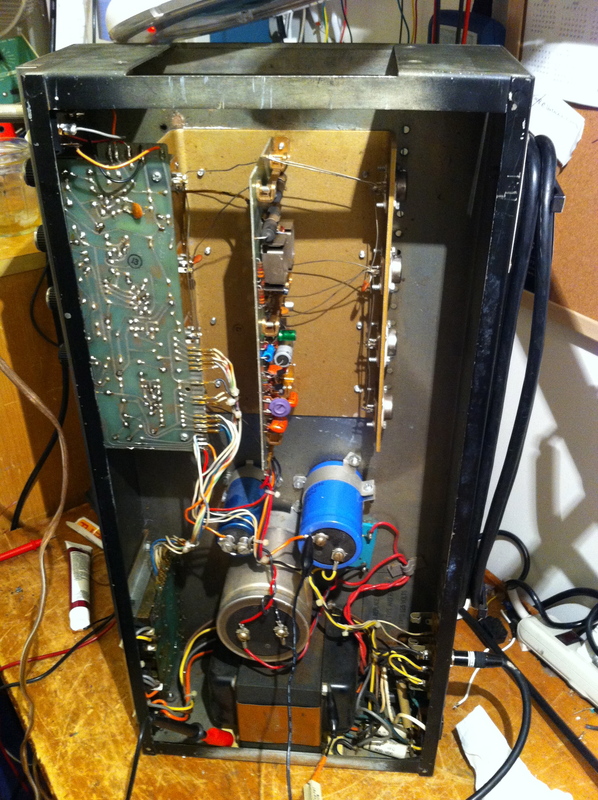 Huge power transformer down below, preamp board on the top left, power amp board in the rear (bottom) of the chassis with the output transistors mounted on a large gold heat sink, and three massive can-style electrolytic capacitors in the middle. Biggest cap (silver) for the power amp, top left can cap (smallest one) goes to the preamp, and the one on the right couples the power amp to the speaker. If you look close you can see the purple circular trimpot on the power amp board towards the lower half of the PCB. It is slotted so you can turn it with a screwdriver. 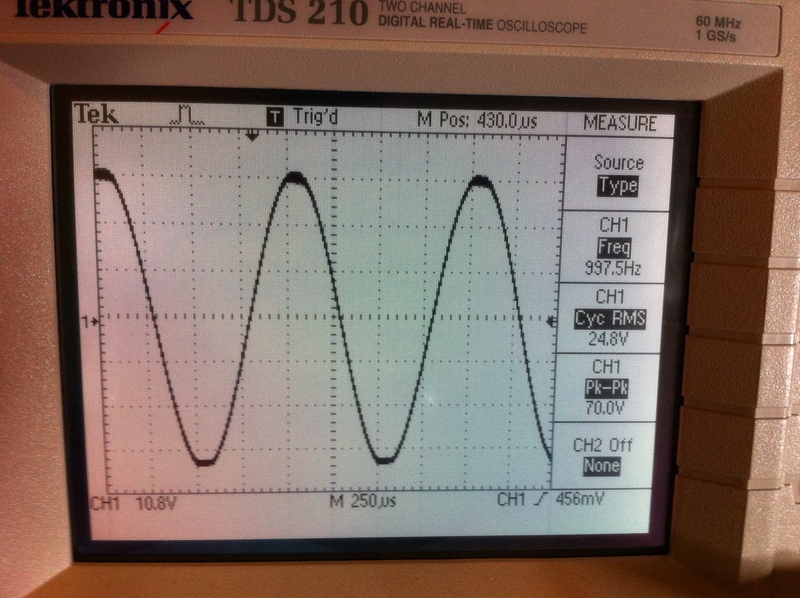 This is the symmetrical clipping offset adjustment (R304 on the schematic). It’s used to adjust the DC voltage on the capacitor connected to the speaker jack to HALF the power amp supply voltage. 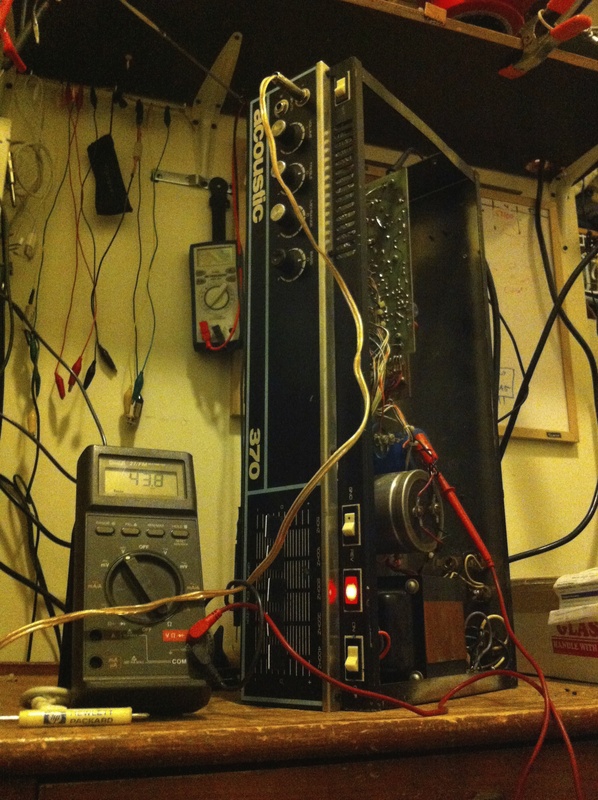 In this case the power supply voltage 86.6V. Even when cranking the trimpot all the way the lowest voltage within reach was 51.2V. A check of the resistors in the circuit revealed some drifted ones that needed to be replaced. 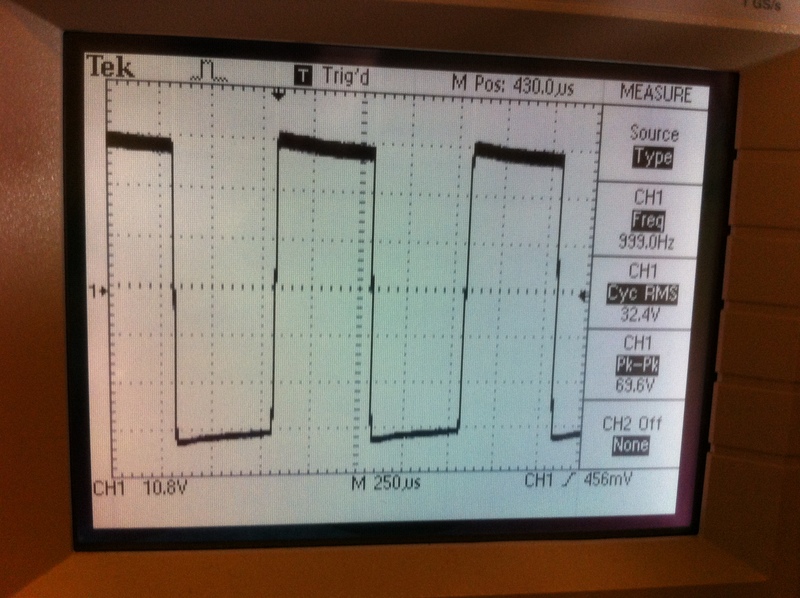 For instance R303, a 180K resistor connected directly to R304 trimpot measured 223K. The previous picture shows the amp after repair powered on at idle with multimeter displaying voltage at the cap coupling power amp to speaker jack. Not exactly half but i got the most symmetrical clipping IMO with 43.8VDC. Before image of 370 output at the onset of clipping. 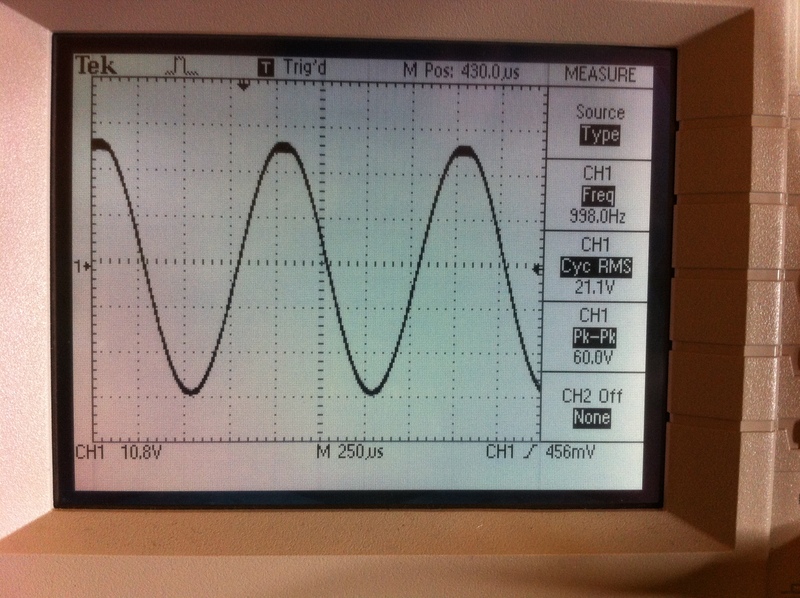 The top of the waveform is fattening and flattening and the bottom is still nicely rounded. Doing 21.1V into 4 ohm load for 111W. After image. Symmetrical clipping trimpot is adjusted and the 370 is doing 24.8V into 4 ohms for 153.8W. And heavy distortion for all you rockers. 32.4V for 262W into 4 ohms. Don’t forget, this amp can go down to 2 ohms and yield more power still.